I was very fascinated by an article in the Times recently, which talked about 'The Urge to Splurge'. I think for whatever reason, many of us tend to treat ourselves to fashion and beauty buys on a regular basis, whether we feel we need a reason to do so or not!! Now, the last three items are thrifted and because the amounts are so minimal, I tend to thrift on a very regular basis and pay cash in the process of doing so. I do try my best though not to buy just anything. Just because items are cheap, they do still need to be of a good quality for me and have a place in my wardrobe. The Chanel bag was my main 'wishlist' item that I acquired by selling some of my existing dresses that I knew I no longer wanted. So in effect, although it was my most expensive purchase, I didn't actually part with any cash to buy it-it was effectively a 'trade' as such. So, my main shopping tips are to thrift, which means you can spend a lot less on higher quality items, or evaluate whats in your wardrobe and if you have an item thats an expensive wishlist piece, sell some of your unwanted clothes, bags, shoes or unused beauty products to buy that elusive item you've wanted for ages, without going into debt for it. - Ask yourself: “Do I deserve it?” Reasons to answer yes include clearing your credit-card debt, surviving a hideous week at work and not having splurged since Christmas. - Pay in cold, hard cash. It cuts the guilt factor in half and is the only way to know if you can truly afford it. - Splash out on something useful. The more you use/wear your purchase, the easier it will be to justify the money spent. - Spend big at sample sales and outlet stores. Your inner accountant loves a bargain. - Treat yourself to the most expensive version of everyday basics — tea bags, socks, chocolate. A little bit of luxury goes a long way. Very informative post. Things to consider. My last item was on clearence..and I could incooperate it different ways in my wardrobe..so I thought it was a good deal. I know if I have something coming up..that I dread..I do like to treat myself to some good chocolate or some sort of treat I can look forward too. Thanks for your sweet comments whilst I was away, m'dear. Also, this is such a relevant post. We do seem to be in an "urge to splurge" time, don't we. Hope you're having a fab week. Sharon: You're a woman who truly knows the value of what you want. When you mentioned "thrifting" in your PF blog, I didn't realize you were buying such wonderful items! Your purchases in April were definitely "guilt-free" and congrats on that! The Times needs you to write an article on thrifting! I like your advice best, Sharon. The Times is a bit wonky if you ask me ... splurging at outlet malls and sample sales can be so dangerous. You buy bulk, but do you actually want any of it or are you just going for the irresistible bargain? Great, helpful post here! From reading the tips, it looks like I certainly don't deserve to buy myself anything for a while haha. If only I could stay away from the shops!! i totally agree with you about little lux in life. my simple lux is chocoalte. Hoo, the chanel bag is amazing !! yes, that Chanel was definitely the best buy! Just in time for my new budget restrictions! I'm always so impressed with your thrifting and your ability to clear out your closet and spend the money on something you truly love. Why to go, SR! Great post, Sharon! 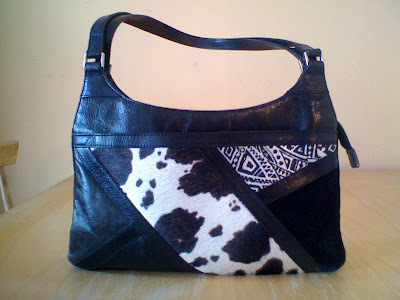 Good news, I got my name back, so its back to www.siljesfashion.com! Lovely items you bought, and I think they're guilty free. I think it's a great post, with great tips. 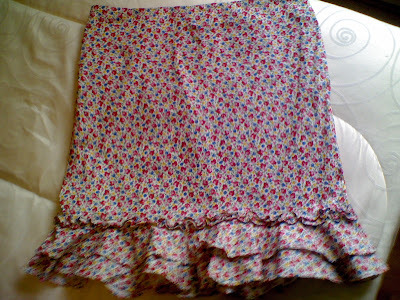 I love that skirt - and i am a guilty shopper!! I can't help it! i really like your fashion blog. i love clothes and accessories ... more importantly, new clothes and accessories. however, i really hate shopping. any advice for a girl like me? Too many of my girlfriend are in debt because of their shopping habits...and I'm not trying to say that I'm a saint either...Oh I'm very bad sometimes too, but I try my best not to go too crazy with it...Unfortunately there aren't such great vintage or thrift stores here in Toronto...or maybe there are , but I'm yet to find them! But yes, I need to start THRIFTING! Hi there-thanks for all the lovely comments everyone and to Ms MoneyChat, I've answered you on your blog! Your thrifting skills are the best. I am always so jealous of what you get! Love these tips! 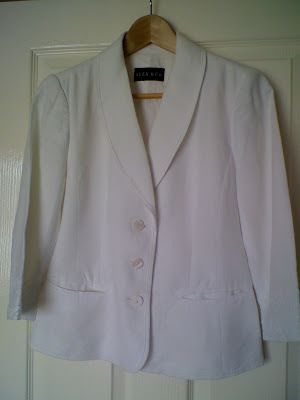 And that white blazer is fantastic! My first visiting, The Chanel bag and the skirt are lovely. I like the post, very helpful. that chanel bag is beautiful! Thanks so much for the note..oh..did I mention..I do love that ruffled skirt. 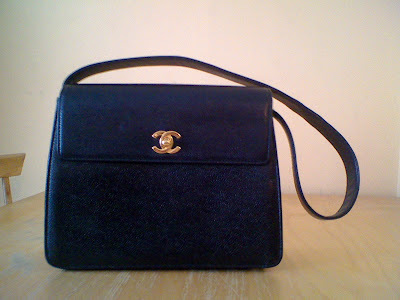 You did such a great job this month, still can't get over that fab little vintage chanel bag! Hi ladies-thanks so much for all your lovely comments, much appreciated! awesome chanel bag! i really like the advice of paying in cash - whenever i do i am such a more responsible shopper! Hi alissa-so kind of you and thanks for stopping by too!